The three hundred people at the ISAAC Public Meeting at Mt. 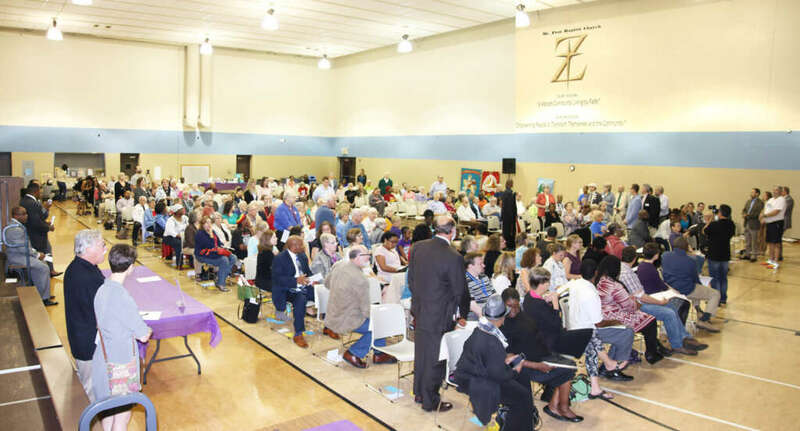 Zion Baptist Church on Thursday evening October 6, cheered enthusiastically for the new strategies ISAAC has chosen and the new community partners who have joined the work on Anti-Racism, Early Childhood & Education, and Youth Violence Prevention. Cara Weiler from the Children’s Trauma Assessment Center (CTAC) showed slides of a normally developing child’s brain contrasted with the brain of a child who has experienced chronic stress—whose brain activity focused on the part of the brain where fight/flight/freeze survival instincts reside, while the brain’s capacity to develop was significantly reduced in other areas related to higher order thinking, problem solving, and emotional and behavioral regulation. Regena Nelson, Department Chair in the College of Education and Development at WMU, and co-chair of the task force, described the growing collaboration called Raising Kalamazoo County that is leading the work to reduce the negative impact of traumatic stress and build resiliency in young children. KRESA Superintendent David Campbell responded, listing seven school districts in Kalamazoo County that have agreed to participate in this endeavor and another district that has already received training in addressing trauma, with good results. ISAAC asked the state elected officials and candidates present, ”Will you ask the Senate or House Majority Leader to have an up or down vote on legislation to require the private sale of firearms to be subject to background checks, much like the sale of handguns from licensed dealers, modeled on House Bills 4590, 4591, and 4592, within the first 100 days of session?” State Representative Jon Hoadley, who is a co-sponsor of those bills, and candidate for the State House John Fisher, and Green Party candidate John Anthony La Pietra pledged strong support. Sign up for email updates at isaackalamzoo.org if you don’t already get ISAAC e-news each month.